Every once in awhile, Jon goes on a baking binge. Wonderful for my sweet tooth; not so wonderful for my waistline. 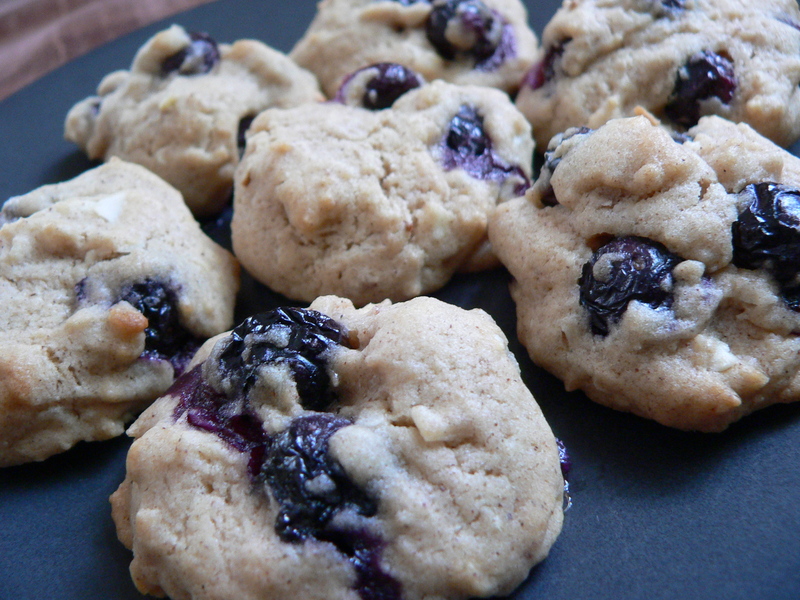 This weekend, he created Brown Sugar & Blueberry Cookies with Almonds and Coconut. Perfect texture- crunchy and juicy. Perfect flavor- light and sweet. Perfect cookie. And yes, we did manage to eat them all within minutes of coming out of the oven. Beat butter and sugar with an electric mixer until smooth. Add egg and vanilla, mixing well until combine, about 2 minutes. Stir in flour, baking powder, salt, 1 1/2 teaspoons cinnamon 1/4 teaspoon cardamon with the mixer on low speed. Mix until dough comes together. Add in milk, coconut and almonds. If dough is still crumbly, add milk 1 tablespoon at a time until it comes together. Fold in blueberries gently with a spatula – it is okay if they break a bit. Refrigerate for 30 minutes. Remove dough from fridge and roll into 1 1/2 inch balls or scoop out with an ice cream scooper. Bake at 375 for 10-12 minutes. Let cool completely.